Students will explore the richly detailed work of quilter Terese Agnew, as she adopts the tradition of the quilt as a carefully made, warm and nurturing cover, for another caring purpose: encouraging empathy for others, whether workers, birds, or forests. In this lesson, students will consider the varied uses of perspective in Agnew’s work, as a compositional technique, as an aspect of empathy, and as a political stance. Students will consider the importance of titles to convey meaning. They will choose a social issue important to them. Finally, students will have the opportunity to experiment with fabric, paint, and stitching, as they create a quilt to craft their message. We’re always trying to increase productivity and consume more, and my work is the opposite of that. 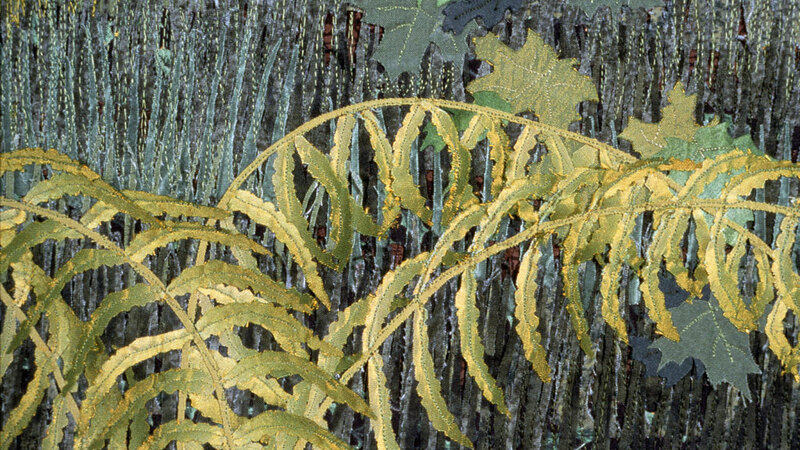 Terese Agnew’s work has evolved from sculpture to densely embroidered quilts by a process she calls “drawing with thread.” Her themes are environmental and social. 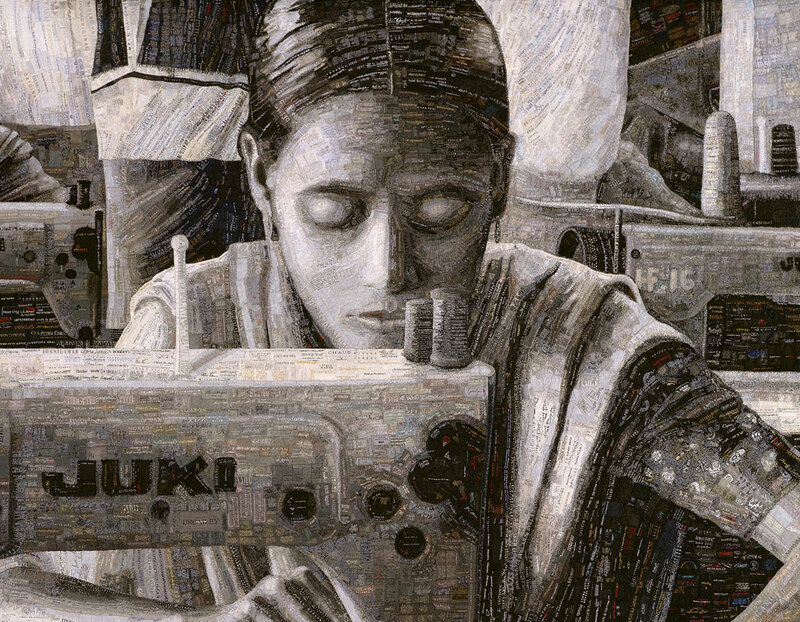 Her most notable quilt to date is the Portrait of a Textile Worker, constructed of thousands of clothing labels stitched together, contributed by hundreds of sympathetic individuals worldwide. 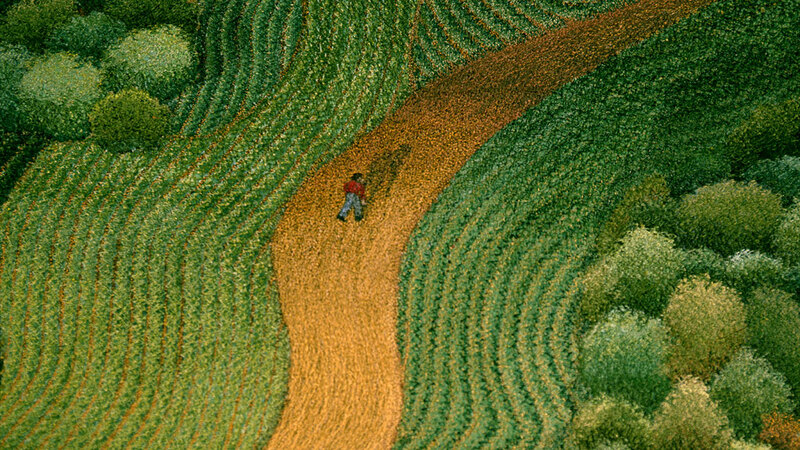 The resulting image is about the exploitation and abuse of laborers, the by-products of globalization and the insatiable American appetite for goods. Agnew’s quilts are included in permanent collections of the Smithsonian American Art Museum, Renwick Gallery, and the Milwaukee Art Museum, among others. Artist Terese Agnew originally wanted to be a writer and children’s book illustrator. Before finding quilts as a medium, she created public art installations, which can be seen on her website, www.tardart.com. Agnew began quilting, “because her house in Wisconsin was very cold in the winter.” She found that quilting was the perfect medium for combining an inviting sense of warmth and security with messages about political issues for which she encourages empathy. • Artworks can provide a means for communication and connection among many people. • People find ways to express political ideas through the arts. • Methods of crafting useful objects can be used to create objects that convey ideas. drawing, a print, or a painting? How is a quilt different from and similar to a painting? 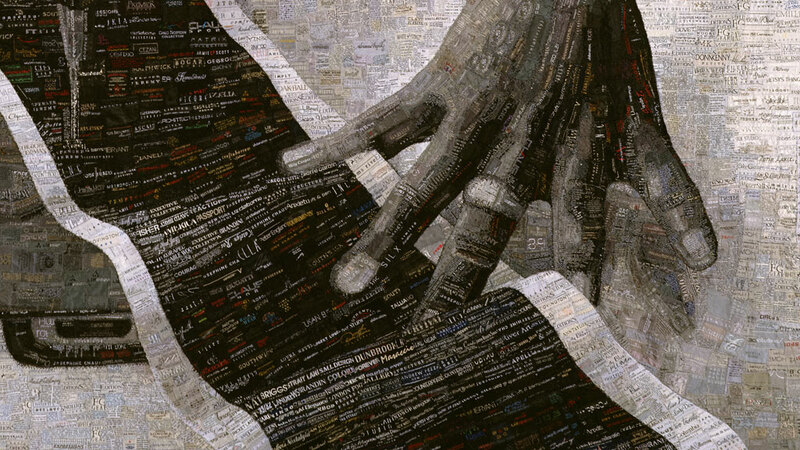 • How might an artwork express empathy? • Become familiar with the work of Terese Agnew and her use of quilts as a medium for expressing political ideas. • Consider the multiple uses of perspective in a work of art. • Invent descriptive titles for artworks. • Create a stitched or painted textile piece to communicate a political idea or message. Empathy, juxtapose, appliqué, machine embroidery, quilting hoop, batting, perspective (its multiple meanings as in Agnew’s work). History/Social Studies: The International Quilt Study Museum (www.quiltstudy.org) has quilts that touch on many historic periods, suitable for an investigation in social studies, including Civil War era quilts, political message quilts, and World War I Red Cross quilts. The interactive timeline is an engaging feature for student research. Also, as stated in the program, quilts (and other needlework forms) were one of the limited forms of expression available to women in the 19th century. An historical investigation of women’s political needlework would be an excellent extension of this lesson. 5. Reflecting upon and assessing the characteristics and merits of their work and the work of others. • Craft in America DVD, THREADS. Also viewable online at www.craftinamerica.org/episodes/threads. • Books about contemporary social topics, such as environmental issues, economic issues, sustainability issues, consumer issues, youth rights issues, and discrimination issues. • Books about women’s history in the 19th and 20th centuries. • Fabrics, such as plain cotton muslin, prints, and solid color cottons (recycled clothes can be used). Natural fabrics such as cotton, and woven medium-weight fabrics work well for quilts, that is, fabrics about the weight of cotton shirts, and no heavier than jeans material, but students may experiment with any fabric. A 12 -inch square each of top fabric, batting, and bottom fabric is a good amount for each student, but as small as 6-inch squares will work. Note: batting is the soft, lofty layer of cotton or synthetic fabric that goes in between the top and bottom layer of the quilt. Before manufactured batting, people made quilts with a layer of wool or flannel for warmth, and these may still be used. What I’m looking for is common ground with shared experiences with people. Explain to students that the artist they featured in the video uses quilts as her medium. Share the following comment made by Terese Agnew: “Everybody has a quilt story. It’s about being loved and cared for, and I think that’s one of the things I’m trying to say with my work.” Based on what the artist has to say about quilts, ask students what they might expect to see. View the segment on Terese Agnew in Threads on the Craft in America DVD or online at www.craftinamerica.org/shorts/terese-agnew-segment. Begin a discussion of Agnew’s work by asking for student reactions. Using this worksheet, have students consider the multiple uses of perspective in Agnew’s work, including as a compositional device, as a political view, and as a sight point of view from a particular place (such as the cedar waxwing’s view of the lot.) Guide students to discuss ideas and to use the available books, newspapers, and online resources for research. Help students choose social issues that interest them, and to define their stance. This could involve discussions with individual students, or opening up discussion about certain topics to the entire class. Political topics encourage lively dialogue. Social issues may be small-scale and local, or large national issues. School issues are social and political issues as well, and students may want to look at their own school for ideas. One generative topic: what would you change about school? When they have an idea and are ready to draw it, encourage students to try different compositional views in their work. On the other hand, Agnew’s quilts are extremely complex, and some students might like to work in a simpler format. Perhaps they will rely on larger shapes and symbols to create their sketch. This sheet will provide the start on a design for their quilt. This worksheet allows students practice with creating titles, and pushing titles to indicate meaning. Provide magazines and strips of paper for practice with inventing titles. Students can create titles that are simply descriptive (which actually takes some time) and then move on to inventing titles that convey other meanings, whether they are humorous, ironic, evoking a mood, creatively descriptive, or purposely ambiguous. Have students practice painting techniques and formulations on fabric scraps. This is a good opportunity to understand the qualities of various paints. Tempera will crack and flake off if fabric is folded, but acrylic and watercolor remain pliable. 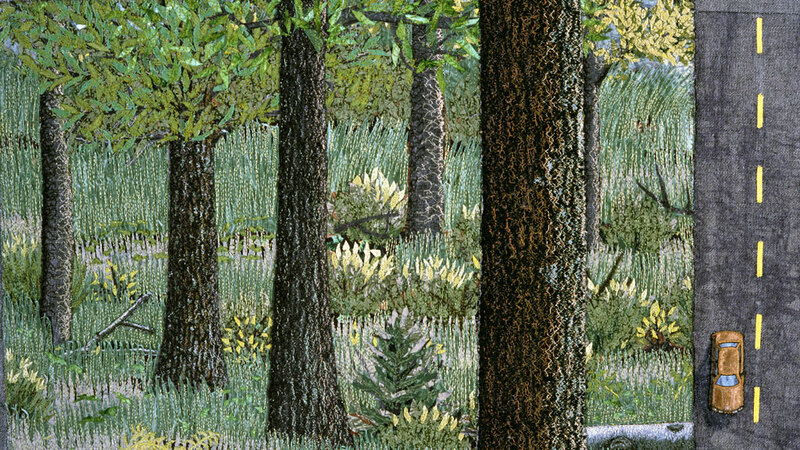 Acrylic can be diluted to achieve watercolor like effects. Also, acrylic is fairly laundry-proof, so students can quilt a wearable item if they choose. Agnew uses a sewing machine, and that can be a useful classroom tool that students can share. The machine can be used for quilting and/or machine embroidery. To make a quilted square, first the top layer of fabric is decorated, then pinned together, right side up, with the batting sandwiched between the top and backing layers. The sandwich is sewn through all layers, creating the dimpled, puffy, quilted appearance. Edges can be finished in different ways: turning in raw edges and sewing, overcasting, or applying binding strips of fabric. To decorate the face, or top layer of the quilt, there are many options, which may be used alone or combined. Designs may be painted on the surface. 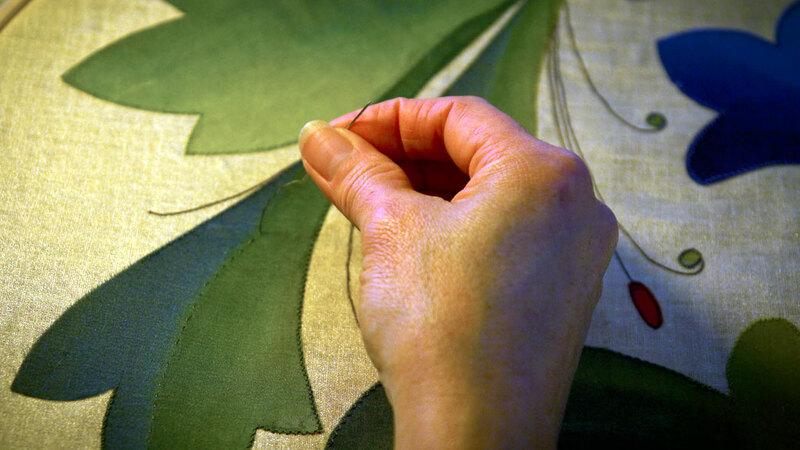 When dry, painted designs may be outlined with stitching. Fabric shapes can be cut and sewn in place (appliqué). Designs can be embroidered by hand or machine. Agnew creates some quilts using fabric that sticks up from the surface, and students may want to try that. Note: Quilts can be very small, just a patch size, or very large (see the AIDS quilt link). Smaller quilts may be more feasible depending on your allotted time with students, and the availability of materials. Keep in mind recycled fabrics from used clothing and linens are appropriate for this project and have a long tradition in quilt making. Consider the possibility of a group project, or allowing students who choose to do so to work together. Agnew’s quilts seek to engage the community, and Portrait of a Textile Worker relied on contributions from thousands of people, who became, in a sense, co-constructors of the piece. Community interaction can occur through displaying students’ individually created pieces to engage the viewing public, or through students working together as a classroom community to create a quilt. Encourage students to examine how Agnew describes her work, and to consider how they will describe their work. Have students write an artist’s statement to be displayed with their quilt. They may want to include details of interest, for example, if they used clothes with a family heritage, such a detail could add to their statement and to the appreciation of their work. Student quilts and these artist statements can be displayed for the viewing of the rest of the school. However, to continue in the Agnew’s theme of engaging the public, perhaps the quilts can be displayed at a local library or community center to engage with a larger community. • Explain the work of Terese Agnew and her use of quilts as a medium for expressing political ideas. • Identify potential uses of perspective in a work of art. • Create a meaningful title for a work of art. • Create a stitched or painted textile piece to communicate a message or political idea. The Educators’ Guide for THREADS was developed by art educators Amy Albert Bloom and Dolores E. Eaton under the direction of Dr. Marilyn Stewart, Professor of Art Education, Kutztown University of Pennsylvania, Kutztown, PA. Lead Author for Terese Agnew: Drawing with Thread is Amy Albert Bloom. April 2012.